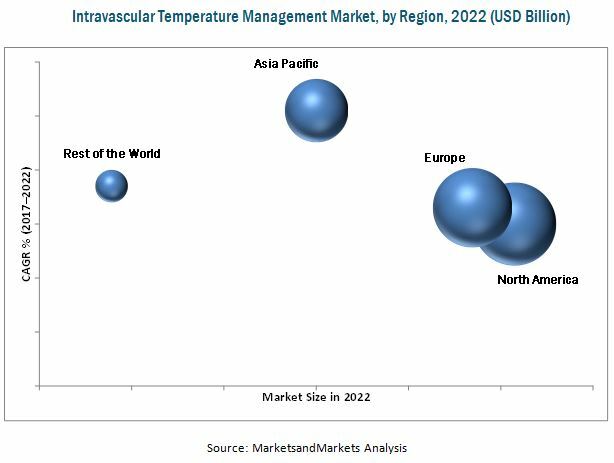 [125 Pages Report] The global intravascular temperature management market is projected to reach USD 272.3 Million by 2022 from USD 219.8 Million in 2016, growing at a CAGR of 3.6%. The base year considered for the study is 2016 and the forecast for the market size is provided for the period between 2017 and 2022. The objective of this report is to define, describe, and forecast the market on the basis of type, application, medical condition, and region. It provides detailed information regarding the major factors influencing the growth of the market. This report also tracks and analyzes competitive developments of the key players in terms of market developments, product portfolios, and financials. 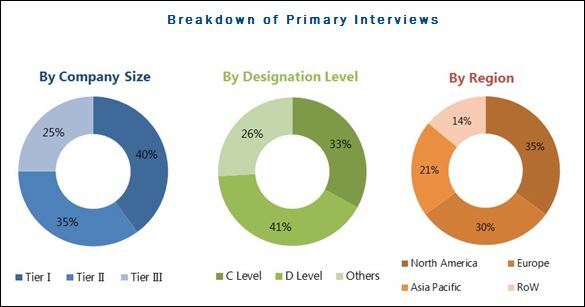 Top-down and bottom-up approaches were used to validate the size of the global intravascular temperature management market and estimate the size of various other dependent submarkets. Major players in the market were identified through secondary research and their market revenues were determined through primary and secondary research. Secondary research included the study of the annual and financial reports of top market players, whereas primary research included extensive interviews with the key opinion leaders such as CEOs, directors, and marketing executives. The percentage splits, shares, and breakdowns of the segments were determined using secondary sources and verified through primary sources. This data is consolidated and added to detailed inputs and analysis from MarketsandMarkets and presented in this report. Some of the secondary resources we referred to are American Society for Aesthetic Plastic Surgery, Canadian Institute for Health Information, American Heart Association, Australian Commission on Safety and Quality in Health Care, European Society for CardioVascular Surgery, and National Institute for Health and Clinical Excellence. The key players in the intravascular temperature management market are 3M (US), Smiths (UK), ZOLL Medical (US), The 37Company (Netherlands), Belmont Instrument (US), Biegler (Austria), and BD company (US). The global intravascular temperature management market is projected to reach USD 272.3 Million by 2022 from USD 228.4 Million in 2017, at a CAGR of 3.6%. The major factors driving the growth of this market include the large number of awareness campaigns/conferences arranged by both public and private organizations, increasing adoption of patient warming and cooling systems in developing countries, and geographic expansions undertaken by key players in the global market. On the basis of application, the global intravascular warming market is classified into preoperative care, operative care units, and post-operative care units. The preoperative care segment is expected to witness the highest growth rate during the forecast period. This growth is attributed to the increasing awareness regarding the benefits of preoperative warming in surgical settings. Similarly, the intravascular cooling market is classified into perioperative care and acute/critical care, by application. The acute/critical care segment is further divided into intensive care units, neurological care units, emergency care units, coronary care units, cath labs, and burn care centers. The perioperative care segment is expected grow at the highest CAGR during the forecast period. The development of technologically advanced systems is one of the factors driving growth in this segment. Based on type, themarket is segmented into two broad categories, namely, intravascular warming and intravascular cooling. The intravascular warming market is expected to account for the largest share of the global market in 2017, while the intravascular cooling segment is projected to grow at the highest CAGR during the forecast period. This high growth rate is attributed to the increasing awareness regarding the use of intravascular cooling in cardiac arrest and stroke care protocol. Based on medical condition, the global intravascular cooling market is classified into cardiac arrest, traumatic brain injury (TBI), stroke (bleeding & thrombosis), myocardial infarction, fever/infection and other medical conditions. The TBI segment is expected to grow at the highest CAGR during the forecast period. Intravascular cooling techniques are being used as a preventive measure to reduce intracranial pressure (ICP) during TBI treatments. As a result, the adoption of invasive cooling technologies in neurocritical care units is on the rise. North America is expected to hold the largest market share of the market in 2017, followed by Europe. The North American region is also expected to grow at the highest CAGR during the forecast period. Factors such as the increasing number of surgical centers, high incidence of cardiac arrests and neurological disorders, and the high adoption rate of technologically advanced devices in North American countries are driving the growth of the market in the region.